It’s pretty frustrating, therefore, having to guess if and when a company will release another online presentation. Webinars—just like blog posts and email marketing messages—should be delivered at regular and consistent intervals. And while you may not have the resources to pull off weekly or even bi-weekly presentations, you should find and stick to a regular schedule so that attendees never have to wonder about when they should pencil in the next presentation. 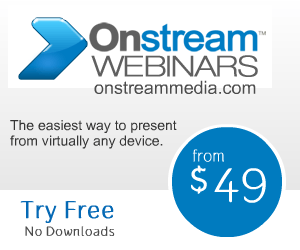 What’s the benefit to hosting webinars at regular intervals as opposed to sporadically? By creating a regular cadence, you’ll build a steady base of viewers who will get excited about your brand and will tune in on a regular basis. This will help you not only to grow your webinar subscriber and attendance base, but to also benchmark your success. For instance, your goal could be to increase your audience base by 25 people each time. If you’re successful, you could ramp up your goal to 50 new attendees each time. It’s therefore critical that you have a scalable and reliable cloud-based platform that will accommodate new attendees as word spreads about your brand online. You don’t want to reach a ceiling where you have to start turning attendees down because of a lack of space.